Here we are again; this week begins the annual gargantuan lollapalooza of First World consumerism. I love shopping as much as anyone. Give me twenty dollars and a quiet hour at Goodwill and I will come home with two bags of random cool stuff, 37 cents, and a song in my heart. But that is not what we are talking about here. The average US/North American family last year spent nearly $900 dollars on gifts. Much of what we buy will be products made by exploited people in countries far from our eyesight. There is a lot of information on the internet about third world sweatshops, garment industries, food productions, etc. Go ahead and ask the internet if YOUR favorite brands pay their employees fairly. Wanna really freak out? Ask the internet where on-sale shrimp comes from. Shudder. You don’t need to become an expert but get some reality under your belt before you walk into Toys-R-Us or Walmart or the sweater department at your local mall. Self-education is a powerful and radical act. 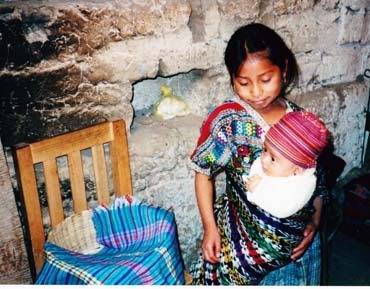 I went to Guatemala on a MayaWorks tour for the first time in 2002. I did it because my BFF Kathleen said I had to. (If you know Kathleen you have probably also done stuff she told you to do. Hi Kath!) I wrote about it in the newspaper column I had back then; I hosted consignment MayaWorks sales, made friends who are still my friends, and the next thing you know Racine, WI was one of the hotspots of MayaWorks activity - so I was invited to be on their board. I traveled to Guatemala three more times; twice arranging my own side-trips to stay weekends in the countryside with a MayaWorks weaving family. I learned so, so, so much. What are things to consider as you holiday shop? 1. First of all, if all of the world’s financially secure families decided to commit 1-2% of their annual gift budget to Fair Trade products, we could come close to stamping out dire global poverty in one generation. 3. This is generally how poor people got so poor: Folks lived in the countryside where they were able to support their families via subsistence farming. Governments, trade agreements, and multi-national corporations changed the world quickly; the need for cash trumped the ability to use the land in traditional ways. This created realities such as if you don’t pay taxes the government will take your land – so you can’t grow corn and beans anymore. You need to grow and sell cash crops such as strawberries and broccoli. When Americans in the Midwest (for example) decide to tighten their belts for all the reasons we do that, then there is no market for strawberries in February and now those third world farmers have no cash with which to pay their taxes, or rent, or school fees for their kids, or to buy the food they need to buy to replace the corn and beans they can no longer grow in sufficient amounts. It’s a vicious cycle that has nothing to do with laziness. If a Fair Trade organization such as MayaWorks enters the story - this is what can and often does happen. A group of artisans or farmers in the rural community will come together to work under the occasional supervision of Fair Trade employees from the city. To grow or create products that are legitimately Fair Trade is a process; one has to learn new skills as well as collaborate on the old ones. Fair Trade organizations pay local artisans and farmers wages that are similar to the legal minimum wage in their country. No one gets rich but with additional cash income the family can survive small ups and downs of financial life. In the family I visited, now the dad and adult son could afford to plant some of their land to corn and beans for the family to eat, another section of land grew strawberries. They could diversify because they had cash coming in from their wives. Now the family could also - and this is revolution one family at a time – they could afford public school fees for ALL their four school-age kids and grandkids. Families struggle to keep their sons in elementary school as long as possible. Without Fair Trade, if the family is struck by a downturn (the dad gets a hernia and can’t work, someone gets sick, a mudslide destroys their house, a hurricane wipes out this year’s crop) - then this is what people do. They abandon their villages to move into the city. The adults get jobs in factories and the girls in the family do the child care and cooking while living in unregulated, dangerous, shack slums. While the parents are at work, making the things we so blithely buy. Fair Trade slows down the process of poor people becoming citizens of the world we live in now. If the kids can complete grammar and high school they can get better jobs. The women are valued for the incomes they generate. Partner abuse reduces greatly when the wife and mother in the family also earns an income. When you train men towards better jobs and more income, many men spend that money on themselves. If you get that money to moms - they spend it on food, education, and medical care for their families. This is a stereotype – but it has strong truth in it. Line up the kids in a poor village. The children of the artisans who work for Fair Trade organizations are taller! More food to eat. More protein. More security. Bigger smiles. We were visiting an artisan community in the hills overlooking Lake Atitlan. Someone asked the women what we should say to our friends back in the States about buying their products. One of the women stood up. She was beautiful in her traditional Maya blouse and skirt, hair in a long black braid, high cheekbones in an oval face. It isn’t charity. It’s using the power of the credit cards in our wallets. It’s deciding that while we are loving our friends and families, we are going to help other women and men love theirs. If you would like to reprint this in your social service or church newsletter, feel free to contact me and I will send you the Word file with or without the photos. All you need to do is credit me and run my web address. No payment. Let’s do our best to share what we know. Thank you so much for writing about this. Shopping small/local is near and dear to my heart and the way I choose to give back to my community and, by extension, to the world. I believe small batch makers are the people who are really going to make our country great "again"! I agree. We look for big solutions because we want there to be one answer that fixes all. We underestimate the power of thoughtful choices and a neighborhood world view.